Never a more truer word spoken. Do you land on grass or soft ground?? If so you could from Spruce buy a 380x150-5. It is 15" dia and 6" wide. DARS: Will my data plate stamping job fly? NX13PL – Out of Phase 1 – still in testing…. Then you have three individuals, Me, Myself and I. There will be only two others to share the experience. I agree with the others above. Thanks for taking the time and trouble to photograph this procedure and post it here. I have book marked it for future reference. True Bill, on all three points you make. I did mention the added complexity. Check this thread out I started a few weeks ago. It pretty much says what I asked and answers your question. Welcome to VAF Olli. Nice to see someone in a neighbouring country. You have a great big empty feeling at the moment. This will slowly pass but not go away entirely. The memories of the good times will remain. We should use strawberries. After all it is just a number. Just make sure you use one number, stick with it, and have an easy way to convert to other measurements. I have dogs, so it is sweep up chips after every session- Has to be a habit. I am always grateful for your input Smokey. Design for lifting/placing the lower cowl? Great Idea and so simple and cheap too. The best ideas are the simplest. I am going to store that away somewhere on my website. I hope you don't mind if I copy your photos. Thanks very much for an excellent idea. Poll: Poll: How Many Different RV’s have you flown? Zero, nada, zilch. I am Jealous. Here is something I googled. It is not an RV. It shows the safety wire preventing the nuts (bolts) from undoing. Hope it helps. Use 0.040 as Gil suggests. It is a little treasure chest located at the end of each rainbow. I am 60 next month Willie, I hope to be doing what your doing now when I am 70. Well done mate. Could you post more pictures of your 4? Thanks Ken for the qualified aeronautical engineers point of view. Thanks for those words Steve, they help a lot. Hey Kevin, That was a very quick response. Thanks very much. We could thrash this one to death in a new thread, if it's not been done already? Did you ever fly out of Egelsbach near Frankfurt Michael? That means you will take off with just over 14 US gallons of fuel on board. Hopefully no one blocks the runway while your hanging your wife upside down Steve. 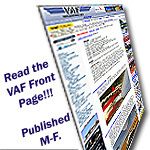 Here is a good source of information produced by The EAA on sheet metal working. I will double check. I could have sworn it was. Dad, my RV Buddy has moved on. Thanks Deal, pounding will be commencing very very soon. You name it. There are many ways it can get wet. You leave the canopy open and a sudden shower of rain occurs. (Don't ask). You spill your favourite beverage while flying (again don't ask). I too am very jealous Dan. You have a great looking 3 there and you must be very proud. Nice one Bryan. Another one for the "Tips"" section I think. What do you say Moderators? If the insulation gets wet, it will hold the moisture and corrosion could get started. Excellent report. I have book marked this one and it should go into the "Tips" section IMHO. Glad to see you posting on other threads too Bob. Thanks Deal, I have taken a look at Pierre's thread and I have found it very interesting and have I have also tagged it for follow up. Question for the medical community--Sciatica and pilots. How are you? Still in Austria? Grove Gear lower brake line tip. I would take care that the flexible hose has no chance on rubbing on the tyre. (tire for my US cousins). Does anyone have any feedback on the above Cleveland product? I have dealt with Cleveland and I do know they are a very reputable company. So it looks like I will go Oregon Aero and get the cushions covered locally in Switzerland or Germany. Steve, I could not find any pictures on your site unfortunately.